The first thing I did after I got my pants on after the race was use the bathroom. I was expecting the bathroom inside the store to smell terribly. It didn't, but the toilet was covered in pee (and someone was very dehydrated!) Pretty pathetic. KC always talks about how runners are the most selfish people when they have a race coming up, and I agree. Do people really think that their half-marathon or 5k is so important that they have to PISS all over the place to get to the starting line in time? Gross. Anyway, I went on a cool-down with Matt and Batalado. We went back out to the slavery museum, but again only as far as the mile turnraound. Chris cut it short, and Matt and I went really slow. It took us over 14 minutes to run 1.7 miles. Pathetic! I was in so much pain the whole time too; more pain that during the race. I felt like my left hip had been hit with a sledge hammer. After the cool-down, I went inside to bunker down and stretch in the warm, dry store. While I was in there I talked to everyone and stretched, had beer and too much pizza, and just socialized. It was nice. Since I really didn't care about the race and I was happy with my 75:32, I was in a good mood. Other people seemed to be in general high spirits as well. It was considerably better than last year when I left immediately afterwards with near-hypothermia. I got $50 cash as my prize for third place, the same as Scott's winning 5K prize-- although his was a gift certificate. To think that I could have run 10 miles less, slower than my last 5k of the race, and come out even. I guess I would have had to pay to enter the 5k though, and I was comped for the half. Gosh, I feel like Matt, complaining about the prize I got being unworthy of my accomplishment. Speaking of Matt, he was 1st Masters and got $50 cash after running 83 minutes. So he broke even on the day. The two of us hung out for a long time after the race, waiting for the store to clear out. Matt ended up doing some shopping while I stretched out, used the T-Roller and the foam roller for about a half hour. I should have gotten paid for demo-ing all that stuff to potential customers. Maybe one day I'll get that sponsorship deal I deserve. KC got off work about an hour early and we both left around 11. She'd been there for 5 hours and definitely made more money than I did on the day. As we walked out of the store, it started to pour down rain. It may have been raining for a while as I sat in the store, but I'm glad I stayed out of it during the morning. The rest of the day I stayed inside for a long time. By the end of the day, I was pretty sore. I walked with just a little bit of a limp, but it was mostly hip pain. That all probably comes from my IT band. So now it's time to take care of myself. I'm not going to run any more for the rest of the year. I'll take this whole week off, except for possibly running club (if it's not cancelled), and then over Christmas break I'll swim. January 1st will begin with a vengance. There is no Champion Chase for me to train for. 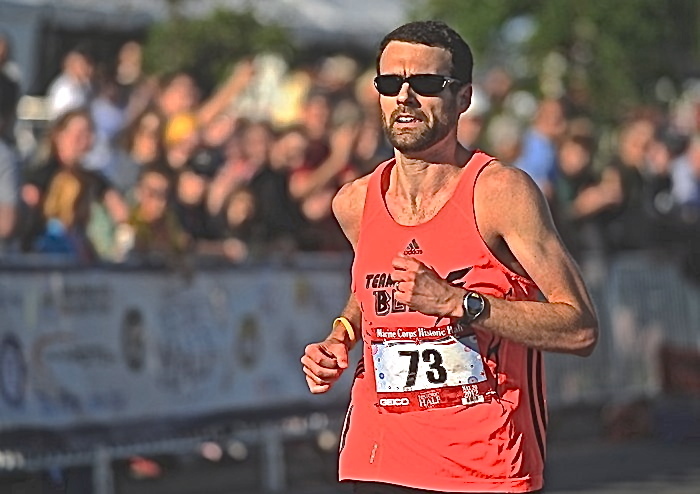 My first race will be the Sweethearts 4-Miler, and my peak races for the spring will be the Colonial Half, Battleground Relays 5000m, and J Brian's 15K. Also my wedding-day long run.